Your day-by-day itinerary now includes Blazing Saddles Bike Rentals and Tours as well as Sausalito Boardwalk. Get some cultural insight at Alcatraz Island and Union Square. There's still lots to do: hunt for treasures at Ferry Plaza Farmers Market and don't miss a visit to Lombard Street. To find maps, where to stay, and other tourist information, use the San Francisco trip itinerary maker tool . Amsterdam, Holland to San Francisco is an approximately 13.5-hour flight. You can also do a combination of train and flight. The time zone difference when traveling from Amsterdam to San Francisco is minus 9 hours. July in San Francisco sees daily highs of 26°C and lows of 16°C at night. You will have some time to spend on the 19th (Fri) before leaving for Oakhurst. Your day-by-day itinerary now includes Yosemite Valley Floor Tour as well as Mariposa Grove of Giant Sequoias. On the 19th (Fri), make a trip to Scenic Route Highway 49 and then sample the tasty concoctions at Southgate Brewing Company. 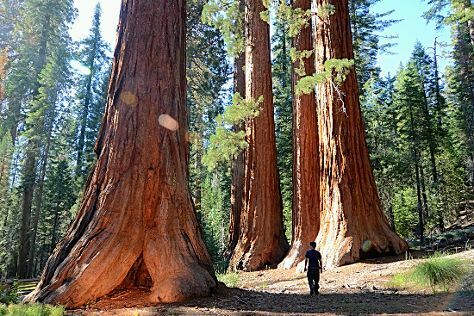 Keep things going the next day: walk around Mariposa Grove of Giant Sequoias and then take a memorable ride with Yosemite Valley Floor Tour. To see photos, other places to visit, ratings, and tourist information, read Oakhurst trip planner. Traveling by car from San Francisco to Oakhurst takes 3.5 hours. While traveling from San Francisco, expect much warmer days and somewhat warmer nights in Oakhurst, ranging from highs of 43°C to lows of 20°C. On the 21st (Sun), you'll have the morning to explore before heading off to Mammoth Lakes. Mammoth Lakes is a town in Mono County, California, the county's only incorporated community. Your day-by-day itinerary now includes Grant Lake Marina as well as Crystal Lake trail. On the 21st (Sun), take in the waterfront activity at Grant Lake Marina and then trek along Crystal Lake trail. To find other places to visit, traveler tips, more things to do, and more tourist information, you can read our Mammoth Lakes trip itinerary planning website . Traveling by car from Oakhurst to Mammoth Lakes takes 7 hours. Traveling from Oakhurst in July, things will get a bit cooler in Mammoth Lakes: highs are around 33°C and lows about 9°C. On the 22nd (Mon), you'll have the morning to explore before heading off to Las Vegas. Your list of things to see and do now includes SlotZilla Zip Line Las Vegas, Wet'n'Wild Las Vegas, Hoover Dam, and other attractions. Plan my Las Vegas trip by asking Inpirock to come up with tips and suggestions. Traveling by flight from Mammoth Lakes to Las Vegas takes 6 hours. Alternatively, you can drive; or take a bus. Traveling from Mammoth Lakes in July, expect Las Vegas to be warmer, temps between 47°C and 32°C. Cap off your sightseeing on the 25th (Thu) early enough to travel to Kingman. Kingman is a city in and the county seat of Mohave County, Arizona, United States. You've now added Historic Route 66 Museum to your itinerary. Use Inspirock's suggestions to plan your Kingman trip and find the best activities and attractions for your vacation. Drive from Las Vegas to Kingman in 2 hours. Due to the time zone difference, you'll lose 1 hour traveling from Las Vegas to Kingman. Plan for slightly colder temperatures traveling from Las Vegas in July, with highs in Kingman at 43°C and lows at 25°C. On the 26th (Fri), you'll have the morning to explore before heading off to Barstow. Barstow is a city in San Bernardino County, California, United States. Your day-by-day itinerary now includes Outlets at Barstow. To find photos, ratings, reviews, and other tourist information, go to the Barstow trip planner . Getting from Kingman to Barstow by car takes about 3.5 hours. The time zone difference moving from Mountain Standard Time (MST) to Pacific Standard Time (PST) is minus 1 hour. When traveling from Kingman in July, plan for a bit warmer days in Barstow, with highs around 47°C, while nights are about the same with lows around 28°C. You will have some time to spend on the 27th (Sat) before leaving for Los Angeles. Your day-by-day itinerary now includes Griffith Observatory. Give yourself a bit of retail therapy at The Grove and Rodeo Drive. Relax by the water at Venice Beach and Boardwalk and Santa Monica State Beach. Go for a jaunt from Los Angeles to Santa Monica to see Third Street Promenade about 30 minutes away. The adventure continues: get in on the family fun at Universal Studios Hollywood, browse the different shops at Two Rodeo Drive, stop by Amoeba Music, and appreciate the extensive heritage of Hollywood Walk of Fame. To find other places to visit, where to stay, reviews, and tourist information, refer to the Los Angeles trip planner . You can drive from Barstow to Los Angeles in 2 hours. When traveling from Barstow in July, plan for cooler days and little chillier nights in Los Angeles: temperatures range from 33°C by day to 22°C at night. You will have some time to spend on the 31st (Wed) before leaving for Santa Barbara. Your day-by-day itinerary now includes East Beach, Stearns Wharf, Santa Barbara Scenic Drive, and other attractions you added. On the 31st (Wed), take in panoramic vistas at Santa Barbara County Courthouse, then enjoy the sand and surf at East Beach, then cruise along Santa Barbara Scenic Drive, and finally take in the waterfront at Stearns Wharf. To find photos, reviews, other places to visit, and other tourist information, go to the Santa Barbara route builder site . You can drive from Los Angeles to Santa Barbara in 2 hours. Other options are to take a bus; or take a train. Traveling from Los Angeles in July, expect Santa Barbara to be slightly colder, temps between 28°C and 18°C. You will have some time to spend on the 1st (Thu) before leaving for San Simeon. Your day-by-day itinerary now includes Hearst Castle. Start off your visit on the 1st (Thu): explore the historical opulence of Hearst Castle and then take in the exciting artwork at artifacts gallery. For ratings, traveler tips, reviews, and tourist information, refer to the San Simeon day trip planning tool . Traveling by car from Santa Barbara to San Simeon takes 3 hours. Alternatively, you can take a bus; or do a combination of train and bus. While traveling from Santa Barbara, expect a bit warmer days and slightly colder nights in San Simeon, ranging from highs of 40°C to lows of 15°C. Wrap up your sightseeing by early afternoon on the 2nd (Fri) to allow enough time to drive to Monterey. 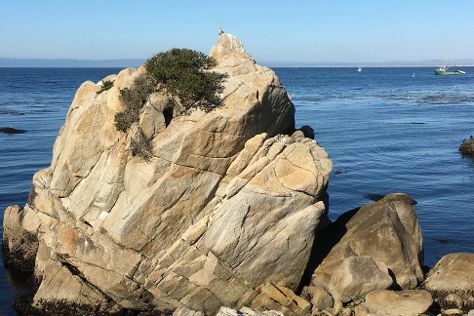 Monterey is a city in the U.S. Carmel Walks has been added to your itinerary. On the 2nd (Fri), get the lay of the land with Carmel Walks. On the next day, contemplate the waterfront views at Monterey Bay, appreciate the extensive heritage of Cannery Row, then don't miss a visit to Pacific Grove Oceanview Boulevard, and finally stop by Monterey's Tasty Olive Bar. To find more things to do, where to stay, maps, and other tourist information, use the Monterey online trip builder . You can drive from San Simeon to Monterey in 3 hours. Other options are to take a train; or do a combination of car and bus. Traveling from San Simeon in August, expect nights in Monterey to be about the same, around 16°C, while days are cooler, around 24°C. Cap off your sightseeing on the 4th (Sun) early enough to go by car to San Francisco. For maps, reviews, photos, and other tourist information, refer to the San Francisco vacation planner . Traveling by car from Monterey to San Francisco takes 2.5 hours. Alternatively, you can fly; or do a combination of bus and train. Wrap up your sightseeing by early afternoon on the 5th (Mon) to allow enough time to travel back home.